When did massive structures of galaxies form? Our current understanding is that the Universe is dominated by dark energy (73%) and dark matter (23%). This is called the ΛCDM cosmology. In such a Universe galaxies and other large scale structures are thought to form through a process known as hierarchical mergers. This means that several less massive systems or objects combine to form more massive ones. From this ΛCDM model it is expected that most groups and clusters of galaxies appear relatively late in the history of the Universe, namely within the second half of its current age. However, several studies have found at least a handful of massive structures of galaxies (such as clusters, massive halos, or proto-clusters) which formed earlier than that, i.e. when the Universe was less than 6 billion years old. How and when did those groups of galaxies form? In order to place further constraints on when such large structures began forming, and to see how well the ΛCDM model holds up, the authors of today’s astrobite, Kang and Im, embarked on a search for massive structures of galaxies. They look at the very early Universe, when it was only about 1.5 billion years old. When one is looking out into the Universe, one is automatically looking back in time as the light emitted by stars and galaxies has a speed limit which it cannot surpass. So, when looking at distant galaxies, the light from them has been travelling for a long time and we are thus effectively looking back in time at an earlier state of the cosmos. Another thing which affects the light as it traverses the immensity of space, is that it gets stretched as the Universe is expanding. This is known as “redshift” as the stretched out wavelengths correspond to redder light. We can get an idea of how far away a galaxy is by measuring how stretched out, or redshifted, its light has become. The best way to measure a galaxy’s redshift – and thereby its distance – is by looking at the barcode-like lines which certain elements, like carbon, oxygen, or hydrogen, imprint on its light. This is known as spectroscopy. Another method is to look at the colours of the galaxy – i.e. how much light there is in a green, blue, ultraviolet or infrared filter – and to use these colours to determine the galaxy’s redshift. This is known as the photometric redshift, and is harder and often less accurate than the spectroscopic one. Having obtained their observations, the authors compare them to a range of template galaxies with different possible star formation rates, chemical element contents, ages, and other characteristics. From this they determine the photometric redshift for those galaxies which had not been followed up spectroscopically. This template-fitting also allows the authors to estimate the galaxies’ masses. The authors are then able to compare the number density of massive structures of galaxies as a function of redshift, i.e. see how many galaxies are found in a certain distance bin (see Fig. 1), to the results from the Millennium Simulation. This is a simulation which models how the distribution of 10 billion particles in the Universe has evolved over time. Each “particle” in the simulation represents roughly one galaxy’s worth of mass. Fig. 1 In order to measure the (over-) abundance of massive structures of galaxies at different ages in the Universe, the authors of today’s astrobite put down circles on the observed field and count how many galaxies are visible in each field. They determine this for many different ages of the Universe, corresponding to different distances from us. They then go on to compare these counts to theoretical predictions of how many galaxies would be observed – and find a significant discrepancy! However, when the authors of today’s astrobite compare the number densities of massive structures of galaxies in the early Universe to the simulations, they find a significant discrepancy between their observations and the model distribution. This seems to suggest that compared to the Millennium Simulation there is a significant over-abundance of massive structures when the Universe was less than about 3 billion years old. What could explain such a discrepancy? Could it be due to cosmic variance, i.e. 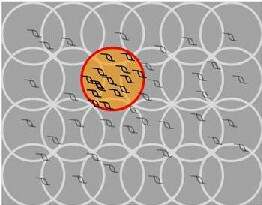 the idea that the number of objects seen when looking out in one direction might not be the same as when looking in another direction? Even though we generally assume that on large enough scales the Universe looks the same in all directions, we do know that it has features which set one region apart from another. Hence the authors suggest that their observations could potentially be explained if the areas in the sky from which they took their observations are inherently different from the average of the cosmos. To test this, the authors divide the simulation into areas the same size as their observations. They then calculate how many of these areas would have a similar over-abundance of massive structures to the one they observed: “none” was their answer, indicating that cosmic variance is a very unlikely explanation for the observed over-abundance. Other explanations proposed by the authors also are not able to explain the observed over-abundance. So what caused this over-abundance? Given the failure of their investigated explanations, the authors suggest three possible causes for the observed over-abundance of massive structures of galaxies compared to the Millennium Simulation: (1) the simulation may be lacking some important physics, (2) the masses of the massive structures may be overestimated in their template-fitting, or (3) there is a problem with the assumptions of ΛCDM cosmology in the simulations. The study’s results are very interesting. If confirmed to be true, they would indeed pose intriguing questions about our understanding of the Universe and the formation of structures in it. I'm a third (out of four) year PhD student at the University of Warwick, UK, where I study local analogues to redshift z~5 Lyman break galaxies (LBGs) which are some of the earliest galaxies in the Universe. When I'm not thinking about galaxies far, far away, I enjoy reading, cooking, and geocaching. Astrobites: A Look back at 2016! 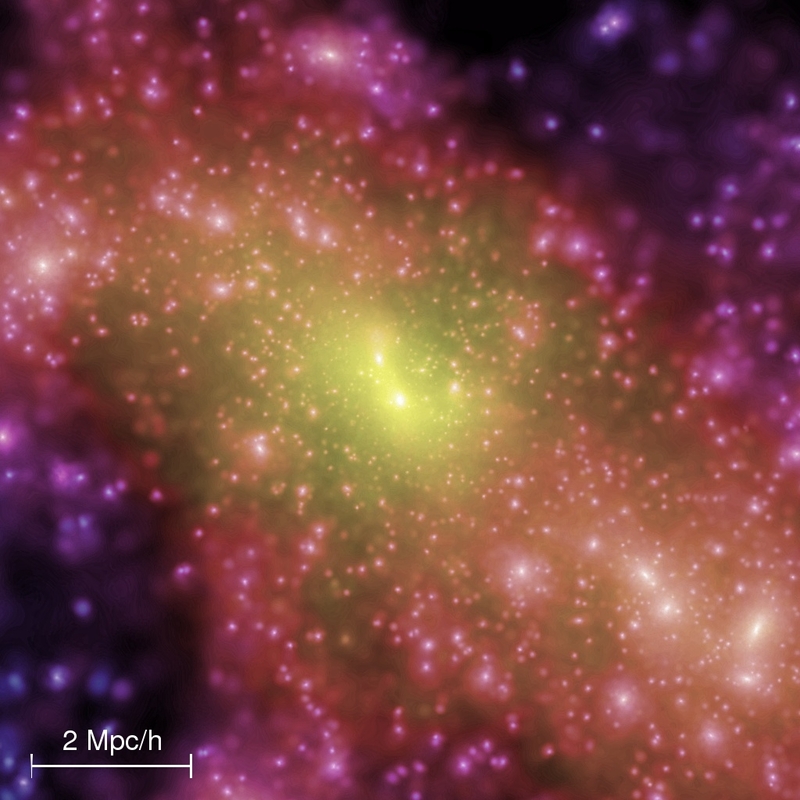 Using Clumpy Streams to Detect Missing Satellites The Top 12 of 2012 Seeing Galaxy formation before reionization: baryon-dark matter relative velocity helps! A well written post that explains a complicated phenomenon in layman terms !